Born in Budapest in 1901, Antal Szerb was one of the leading figures in 20th-century Hungarian literature. Although his family was Jewish, he was baptised at a young age and remained a Catholic for life. A prolific essayist, reviewer and writer of fiction, Szerb is perhaps best known for his wonderful novel, Journey by Moonlight, published in 1937. (I read it pre-blog, but there are links here to recent reviews by Emma and Max.) During the 1940s, Szerb faced increasing hostility and persecution due to his Jewish descent, culminating in his incarceration and murder in a concentration camp in 1945. He was 43 years old when he died. Alongside the essays and novels, Szerb also wrote a number of short stories and novellas. Love in a Bottle brings together a selection of these short pieces which span the breadth of this author’s career, from his student years in the early 1920s to the time shortly before his death in the mid-1940s. Next we have The White Magus, a tragic story set in the time of Byzantine Empire. All across Byzantium, children are dying from a strange, unfathomable illness. The only ray of hope comes from the beautiful Princess Zoë whose kindness, compassion and magical touch provide a brief respite from the suffering. As a consequence, she spends her time visiting the sick children of the land, comforting them and helping out wherever possible. When Zoë succumbs to the same illness, the elders of the land set off for the Carpathian Mountains to consult the great oracle, the White Magus. Rumour has it that the Magus knows all the deepest secrets of life itself, so it is hoped that he will be able to cure the princess. Without wishing to give too much away, the Magus can see a possible course of action, but it is one that will come at a price. The third of the early stories, The Tyrant, features the powerful Duke Galeazzo of Milan, a ruler who confines himself to his tower of solitude, never setting foot in the city he presides over with such shrewdness. Despite taking an interest in his protégé — a young boy named Lytto — the Duke has tried to banish all feelings of love from his heart. This is a story which explores the theme of isolation and the struggle to control one’s inner feelings when that state is disrupted. The second section of the collection contains eight stories, all written between 1932 and 1943. The first two, Cynthia and A Garden Party in St Cloud, are free-flowing pieces which feel quite personal in style, almost as though they might have been inspired by experiences in Szerb’s own life. The stories begin to explore the somewhat idealised view of romance that often characterises a man’s youth. They are by turns playful, witty and ironic. Cynthia tells of a brief love affair, a relationship in which the narrator is drawn to the titular character for her superior social class and her eighteenth-century wit. In St Cloud, the protagonist finds himself attracted to two women, one of whom, Marcelle, is the girlfriend of his friend, Gábor. This is a wonderful story which reminded me a little of Journey by Moonlight. Romance features once again in A Dog Called Madelon, in which the protagonist, János Bátky is convinced that he will only find true passion by dating a woman with an aristocratic pedigree – in other words, a Lady Rothesay as opposed to one of the less alluring ‘Jennys’ he tends to meet. This is a story with an ironic twist in its tail, one of my favourites in the collection. In another highlight, Musings in the Library, a young man finds himself falling for a girl he meets in the Bibliothèque Nationale in Paris. This story has an interesting ending, one that highlights the paradoxical nature of life, that sense of tension between happiness and disillusionment. The titular story, Love in a Bottle, harks back to the mythical legends of Szerb’s early stories as the magician, Klingsor, tries to free Sir Lancelot from his love of Queen Guinevere. In this playful piece, the spirit of Love takes the form of a kind of sprite to be found sitting inside the young knight’s body. The Incurable features a writer who cannot prevent himself from putting pen to paper, even when he is paid to give up his craft. This is a comical story, a short sketch but no less satisfying for its brevity. The book ends with a slightly different work: a historical piece titled The Duke, an imaginary portrait of the owner of the Palazzo Sant’Agnese near Rome at the time of the late 16th century. It feels very different to the other pieces in the book, possibly closer in style to Szerb’s novel, The Queen’s Necklace. 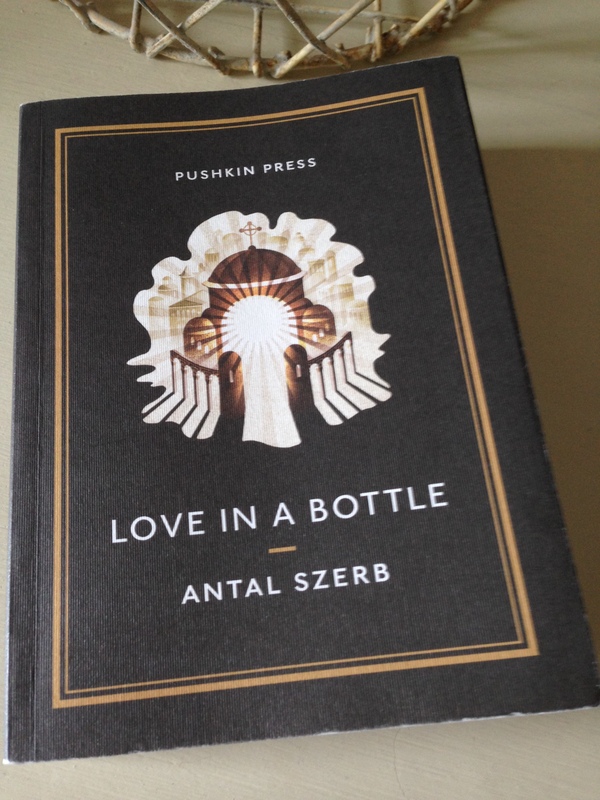 Love in a Bottle is a really interesting collection, especially for lovers of Szerb’s novels (or for readers with an interest in European literature per se). Those with some knowledge of the author’s other works will be able to spot connections to some of these pieces – for example, János Bátky, the lead character in A Dog Called Madelon, shares a name with the protagonist of Szerb’s first novel, The Pendragon Legend (both were published in 1934). The geneses of his themes are here in these stories: the idealised romanticism of youth; a preoccupation with the self; the tensions between opposing emotions; the contradictory nature of life itself. All in all, this is another intriguing collection of stories from Pushkin Press, a welcome addition to their translations of Szerb’s work. This entry was posted in Book Reviews, Szerb Antal and tagged Antal Szerb, Book Review, Classics Club, Fiction, Len Rix, Literature in Translation, Pushkin Press, Short Stories on May 31, 2016 by JacquiWine.